Long time readers of this blog may remember one of my earliest posts which discussed the rising popularity of armourHACs - a gang concept featuring low signature radius afterburning HACs - which proved particularly effective against battleship fleets of superior numbers. While armourHACs enjoyed a brief period of seeming invincibility, existing fleet concepts gradually adapted to counter them and even by the time I wrote my original article, their use was on the decline. With the hybrid weapons buff and the subsequent trend for 'going green', a number of parties have developed (apparently independently) a gallente-centric concept which puts a new spin on the armourHAC gang type. Rather than large battleship fleets, this new concept was designed specifically to counter the kiting battlecruiser gangs which are so prevalent in medium scale warfare (which I define here as gangs in the 15-30 range). In Agony, we call this concept 'TWEED' (TWin EnginE Deimos) - a nod to the common misconception of Agony as a training corp, as well as an inside joke with one of my fellow directors. I'm not claiming that Agony invented this first (I'm sure we didn't), nor that this is necessarily anything new or special - some groups have used similar gang types in the past. However with recent changes I believe it's a particularly effective gang type for the Eve of today, and I hope some of you find this writeup useful. 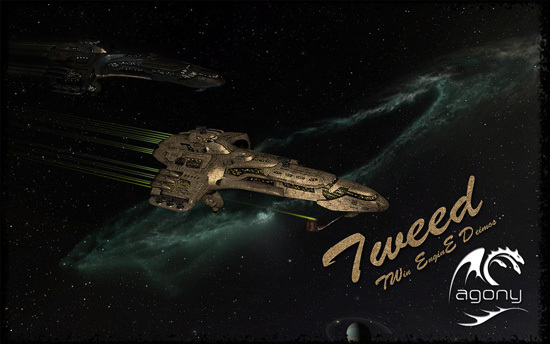 As the name suggests, the main damage dealer of the tweed gang is the deimos, fit for dual propulsion. Unlike the zealots used in traditional armourHAC gangs the deimos has to be up close and personal to apply its damage (or inside 10km at least, with null), however the addition of a MWD allows it to achieve this relatively easily. When supported by skirmish bonuses a tweed deimos can chase down kiting battlecruisers and recons much more easily than those pilots seem to expect (about 1.9km/s with bonuses, compared to 1-1.4km/s for a non-bonused battlecruiser), and the damage they can put out once they do so is really quite terrifying. The afterburner allows deimos pilots to rapidly switch from high speed chasing mode to low signature radius armourHAC mode when called primary, or when a high speed pursuit is not required; once afterburning, the tweed deimos enjoys the same massive survivability boost that made the armourHAC zealots so effective, and the gang's oneiroses can keep it up even an incredible amount of firepower. For those pilots who can't fly the deimos, dual prop fleet stabbers, muninns, and zealots all make viable (if less effective) alternatives. Like traditional armourHACs, x-instinct boosters are a useful addition to furthr lower signature radius. As with the original armourHAC gangs, logistics ships form the backbone of this fleet, and a large ratio is logistics to dps ships (usually between 1:3 and 1:1 depending on the gang size) is normal. Since a tweed gang engagement typically takes place over a large distance, the usual afterburning guardians would quickly be left behind. Instead, logistics is provided by the recently buffed oneiros, again fit for dual propulsion - while they lack the sheer durability and mutual cap transfer of the guardian, oneiroses can provide impressive reps while keeping pace with the tweed fleet's main dps ships. The more logistics ships you have the stronger the gang, however too many can also dissuade an opponent from engaging you. 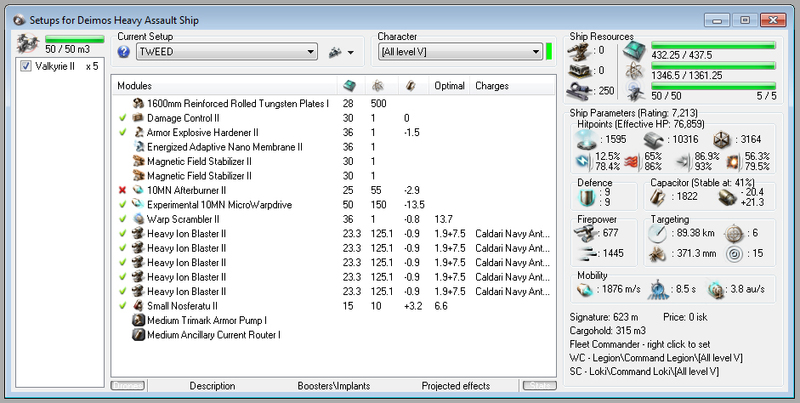 Since two propulsion mods generally makes it all but impossible to fit an oneiros for cap stability, tweed onerioses are cap boosted in order to keep everything running throughout the fight (which incidentally also protects them from neuts, the main weakness of the cap-stable regen oneiros). While this has obvious disadvantages throughout a prolonged fight, most tweed engagements are far shorter than the time it would take to consume all those cap boosters, and the deimoses will typically carry spares to replenish any who get low. With plenty of hardeners combined with the low signature radius of a logistics ship, the oneiroses in this gang are just as survivable if not more so than their deimos counterparts. No tweed fleet is complete without its support ships. A gang boosting loki and legion will significantly improve the survivability of this fleet, while proteuses and lokis with range-bonused tackle allow the fleet to lock down targets much more quickly. Rapiers and arazus are too fragile, and would form a weak link in this otherwise tank-heavy gang. Implementation of the tweed fleet is fairly straightforward. Keep skirmish bonuses out ahead of the gang, to ensure you have maximum speed from the start of the engagement. If you encounter a battlecruiser gang set up off gate (as kiting gangs tend to be), the deimoses rush them under MWD, overheating for the first cycle if necessary (a bonused tweed deimos with overheated MWD will do around 2.7km/s, and will cover the 30-50km to most kiting gangs in relatively little time. Should any of the deimoses be primaried by significant firepower, they switch from MWD to AB and pop their x-instinct booster, while adjusting course to maximise angular velocity if flying against turret ships. During this time the rest of the gang can continue their charge, and as soon as primary is switched the ABing deimos can switch back to MWD and join the fight. Oneiroses will initially hold on the gate, before pursuing the deimoses at range to ensure they remain within rep range. Null is typically the default ammo unless we're expecting a close range brawl, and targets are generally called by distance to the FC - expect even the tankiest of kiting ships to melt quickly under the fire of just a handful of deimoses, and as soon as one falls the process is repeated for the next. Faster, lower dps ships such as fleet stabbers and muninns are free to tackle secondary targets while the main fleet finishes off the primary, and proteuses and lokis if you have them can keep long ranged tackle to ensure that other targets don't warp off. The second type of fight is the brawl, which generally happens on a gate. Here, the deimoses work like traditional armourHACs and primarily operate using afterburners. Ammo type depends on the targets, with close range ammo generally working better against tougher ships where primaries will change less often. The tank of a tweed gang is very strong, and if the fight turns against you it's generally quite easy to deaggress and tank until the whole gang is able to go through. The TWEED deimos is a fairly normal deimos fit with the exception of the dual prop. It's fit for damage, but maintains a strong armour tank with good resists. The small nos isn't all that important, but can help the deimos keep its guns or afterburner running while under multiple neuts. Since the TWEED oneiros is cap boosted, it uses active hardeners to provide excellent resists. This actually makes the onerios the strongest link in the chain, convenient given that logistics tend to be primaried and in a TWEED gang, the oneiroses will often be burning off gate in pursuit of their gang. To be clear, the tweed fleet is not marketed as as undefeatable setup - it's very good against its intended opponent, which happens to be a gang type that we encounter a lot. It's also one of the few true high speed armour gangs, combining the high speed usually associated with shield setups with the superior tanking ability of armour. While I'm loathe to point to killboard stats as a measure of success, for those who are interested the links below should give an indication of how well we've seen this gang work. I wasn't present for the first two fights, however for the ones that I was there for I'll try to provide some context. Note that since in most engagements we took few or no losses, the battle reports may not show all participants (they also don't show our logi, since our logi pilots don't tend to whore on mails - most of these fights included between 4 and 6 onerioses). Example 3 - A good example against a kiting gang. Like many TWEED engagements, the initial charge caught them by surprise and this fight quickly turned into a rout, with most of their gang bailing and leaving anything still tackled to die. Example 4 - The BLACK-MARK gang here was actually quite large (about 40) and we'd been baiting them for a while. They engaged us at 0 on a gate, but unfortunately their all-gallente-jams falcon also warped in at 0 ahead of their gang, leaving them unable to break our reps as they'd hoped. They stayed in the fight for a while, but most of the gang disengaged when it was clear that the fight wasn't going their way. Very interesting concept, will need to give it a try... militia have been flying dual-prop SFIs for some time now with great effectiveness. 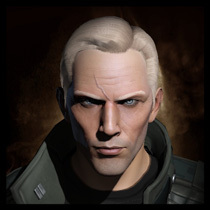 Our alliance also uses dualprop AHacs, but is less focussed and consistent than yours as we have not yet adapted it to fighting kiting tier 3s. I remember recently seeing an article dual-prop deimos, I think about Razor on EN24. The nice thing about the Deimos, as opposed to the Zealot, is that it can perma-MWD. For chasing battles, gun range really isn't an issue as you're burning into point blank anyway. I prefer FNAM for those. Null, with 15km optimal+falloff is good when you're turtling up with ABs and need to switch targets a lot. The Sacrelige is actually better for chasing than the Zealot since it doesn't cap out. Tweed - it's the fabric of choice for the dynamic modern man. Razor made this first...its called the dongcat fleet doctrine. Actually, this kind of gang has been around for ages. IIRC the first time I encountered it was a Darkside gang over a year ago (which completely slaughtered our kiting BC gang). It's not something new, and it was around a long time before Razor published their EN24 article. This post is just an attempt to explain how it works and encourage more people to try it, not to pretend we invented it. Want a little depth to the recent history of Deimos rush? On FHC there was a bit of drama when Agony began posting about the Tweed concept in 2011. Nearby residents Rote Kapelle felt like Agony copied them, while an Agony representative retorted that they picked the concept up from Ninja Unicorns with Huge Horns, yet another neighbouring roaming group. Rote is a splinter off the old Star Fraction which was quite well known for their Gallente RP loyalties (and Thoraxes in AT4). Horn was a splinter reincarnation off an old pirate alliance called The Church, which was quite renowned for blaster rush tactics during the golden age of Gallente in 2006-2007. When the final remnants of The Church fell apart in 2009, they intergrated into Cry Havoc, who by then had already started the AHAC trend as most people know it today. They based it around Ishtars, that later evolved into Zealots when PL picked it up from them, as CH fell apart and largely intergrated into PL in 2010 (either through Habit or GK Inc). The small group that pioneered the Ishtars in CH had begun experimenting with them already when they had their humble beginnings in IRON in 2007. Next to CH, the russian corporation SoT (today in Darkside) also ran Ishtar gangs in early 2010. The development on the russian side is a bit unknown to me, as i'm not russian. Rote and Horn began running Deimos variations (independently, despite living near each other) in the early spring of 2010. By the end of that year Horn had a video out depicting them fighting Darkside Drakes in Deimos rush. That should give you some background to the actors in the 2009-2010 Syndicate wave (i belive Darkside lived in Tenal then, but generally roamed same northern regions as the others). Other groups known to have tried the concept since 2010 include Noir and Rooks and Kings' second founder corp T-SW, among many other (Razor one of them obviously). Then of course, Azual is right, who was actually was first can not really be answered. Probably someone in 2003, but probably not in any uniform way. This traces the lineage of the 2010 wave, which Agony's Tweed is part of and likewise the groups who managed to become somewhat iconic for it, throughout history. Would dual-propped vigilants be a possible alternative? They would work, but as a faction ship most of the vigilant's EHP comes from raw HP, rather than resists like the deimos - that means reps are less effective and so it reduces the size of gang you can tank with a given number of logistics.